The NMAAHC will leave you speechless. The Smithsonian National Museum of African-American History & Culture is an architectural masterpiece that captures the core essence of Black culture, Black history and Black legacy like it has never been done before. ESSENCE had the opportunity to join Toyota, who was selected as the only automotive sponsor of the NMAAHC, for a sneak peek at the historic landmark a few days before it’s unveiled to the public this Saturday and we couldn’t help but tell you all about it. Here are 15 things about the Smithsonian National Museum Of African-American History and Culture that will blow your mind. 1. It’s the first eco-friendly museum on the mall. From the water supply used within the displays, to the actual materials used to erect the building, the NMAAHC is the greenest of all the historic sites on the National Mall. 2. Seeing Nat Turner’s actual Bible will give you chills. Enclosed in a small glass case and donated to the museum as a gift, the Bible of the man who led the most fearless slave revolt in African-American history is quite the sight to see. 3. The museum was strategically built to be the focal point of all landmarks on the National Mall. The NMAAHC sits at the center of all the landmarks on the mall — one of many subtle details that speak not-so-subtle volumes about just how vital African-American history is to the United States. 4. The Venus & Serena statues? You. Are. Not. Ready. 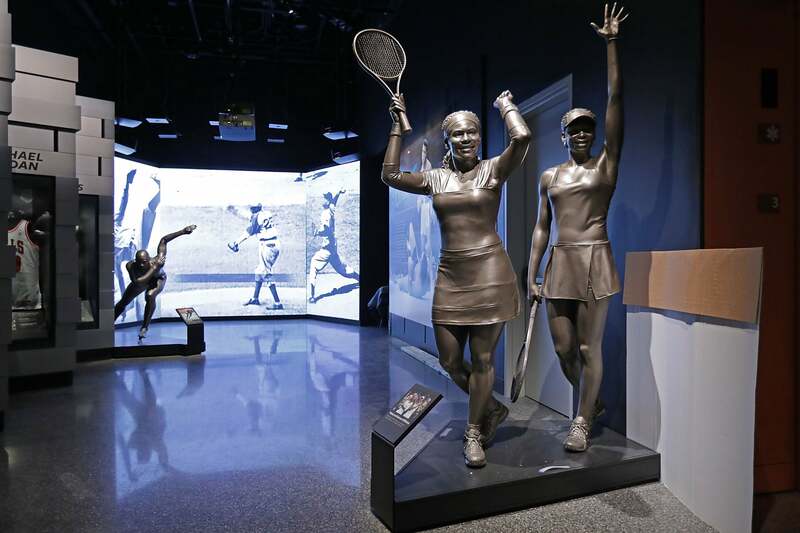 As if watching the Williams sisters captivate the sports world year after year isn’t jaw-dropping enough, the statues displayed in their likeness will have you basking in Black Girl Magic without even knowing it. 5. You can become a part of the historic museum by sharing your story. Interactive rooms on multiple floors in the museum allow for visitors to go inside and record themselves sharing their exepriences by responding to a few pointed questions. Once finished, the recordings are then kept and stored in the museum to be shared later on. 6. The premiere of Ava DuVernay’s newest documentary is the perfect addition to the NMAAHC. Filmmaker extraordinaire Ava DuVernay will christen the opening with the debut of her new documentary, August 28: A Day In The Life Of A People, at the museum’s official opening on Saturday. The film will highlight the connection between several events essential to African-American history including the death of Emmit Till, the night Barack Obama received the Democratic nomination for president and Hurricane Katrina. 7. The ode to Black music is phenomenal. From Jazz, to Hip Hop, to R&B to Gospel, no Black musical stone was left unturned. You’ll have a hard time finding a past or present African-American artist who isn’t recognized in one way or another. Some might even surprise you! 8. First Lady Michelle Obama said it all. Earlier this year, FLOTUS ruffled more than a few right-wing feathers when she spoke candidly about “waking up every day in a house built by slaves,” while reflecting on her time in the White House. For anyone who doubted the accuracy of her words, you’ll find the proof in the museum. And you’ll know it when you see it. 9. The NMAAHC is the last museum to be built on the mall. Joining historic sites like the Washington Monument, The White House and The Capitol Building, the NMAAHC will be the final landmark added to the National Mall. 10. The screening of Underground will be the inaugural program featured in the Oprah Winfrey Theater. The critically acclaimed series was the perfect choice for the first program to be screened at the NMAAHC’s Oprah Winfrey Theater. 11.The entire museum is engulfed in powerful quotes from the pioneers of Black culture. Inspirations, hard-hitting truths and signature phrases that have carried African-Americans through the most difficult of times for decades, you won’t have to look far for empowering words to live by. 12. Actual shackles, collars and other things worn by enslaved African-Americans are just a few of many artifacts featured in the museum. The history behind the thousands of items on display in the NMAAHC make for an emotional experience beyond any you might expect. 13. The past and present HBCU exhibits are inspiring and truly unforgettable. Historically Black Colleges and Universities receive a well-deserved spotlight that will make any HBCU grad proud to be one in the number. 14. Walking through the past while looking at the present. 15. You think you know, but you have no idea. The NMAAHC will take you through the stages of every emotion while educating you beyond belief on the things you thought you already knew about African-American history, culture, influence, strength, resilience and the unapologetic pride that continues to shape who were are as a people today.